Keikis, or children, are always the cutest part of any wedding! Providing them with a beautiful Haku Lei to wear on their head makes them feel so important and involved. And, they take great pictures as well! Another advantage of having a Haku Lei for children is that up on their head it is safe from figgety fingers. This particular young lady was part of a Marry Me Maui and Joe D'alessandro took this wonderful picture. 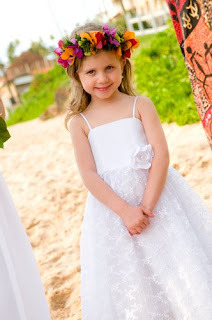 Remember to keep the keiki involved on your wedding and you will certainly go home with some of the cutest pictures ever.